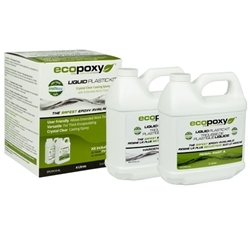 If you are filling voids in a live edge slab or river table top, EcoPoxy Liquid Plastic is an excellent epoxy filler where a crystal clear filler is required. These low odour non-toxic epoxy resins can be tinted with pigments or blended with metallic colour pigments for pearlescent and iridescent effects.Si vous remplissez des vides dans une dalle de bord ou un dessus de table de rivière, EcoPoxy Liquid Plastic est un excellent enduit époxy où un enduit cristallin est requis. Ces résines époxy non toxiques peu odorantes peuvent être teintées avec des pigments ou mélangées avec des pigments de couleur métalliques pour des effets nacrés et iridescents. Liquid Plastic is a perfect casting and see through encapsulation epoxy used for where a crystal clear see though encapsulation is required. Working Conditions: For best results Liquid Plastic must be used at temperatures from 70-80 degrees F. The room which you are working in should be clean, dry, dust and insect free. Settling dust can often cause blemishes on the glassy surface. Recommended Storage: 55 degrees F. through 85 degrees F. with tightly sealed lids. Application: Liquid Plastic should be applied in two stages. The first stage is referred to as the seal coat. The seal coat is brushed on objects in a thin layer and is used to seal any pores in the surface and prevent air bubbles from forming in the following pours. Liquid Plastic will flow and self-level, squeegees can be used to help level Liquid Plastic. Encapsulating Pictures: Objects, such as pictures, maps etc. can be casted and encapsulated in Liquid Plastic during the pours. Most photo quality paper does not require any special preparation however sometimes thin paper objects must first be sealed. Use a solution of 4 parts white glue and 1 part water. This will prevent thin paper objects from becoming translucent, this may be done with a brush. Two coats of sealer is advised. Wait 4-8 hours before pouring Liquid Plastic. Casting and Encapsulating Solid Objects: (wood, rocks, shells, etc.) All porous materials should first have a seal coat of Liquid Plastic applied. This will prevent air bubbles from occurring in the following pours. ECOPOXY Resins are manufactured by ECOPOXY, a leader in the research and development of high bio content epoxy resins. Their product production, and epoxy laminating / finishing solutions for commercial, industrial, institutional, and residential applications are state of the art. Extensive laboratory and field tests, combined with years of satisfied customer use, have proven ECOPOXY to be an unparalleled high value and high performance surfacing solution.